Morning sunlight spills into Tom Killion's studio through a large window looking out onto his home in the backwoods of Point Reyes Station. Wood blocks, saws, sketch pads, carving tools and paint rollers adorn most of the available space on his studio walls. Quail Press, the large printing press Killion purchased in 1977, sits like a trusty friend beneath one of the windows, waiting patiently for the artist to resume his work. Wood blocks fitted together to create the next print still sit inside the press, bespeaking ever-present work in progress. On this spring morning, Killion interrupts coffee with his wife, Katerina, and their dog, Chica, on the back deck of their home to talk about the publication of his most recent collaborative work with Beat poet Gary Snyder. Their book, Tamalpais Walking (Heyday Books; $50), includes personal accounts of the mountain from both artists. Killion, who grew up in Mill Valley, says that his history with Mt. Tam "is very deep and very personal." 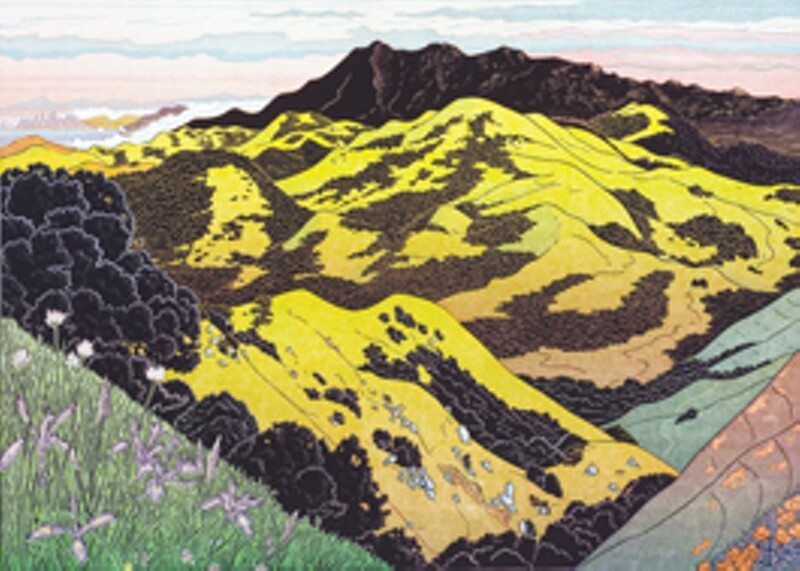 The book contains 60 woodblock prints he made over the years, some dating back to the early '70s when he was still a student at Tamalpais High School. Killion remembers a trip to the de Young Museum with his mother to see a Japanese landscape print exhibit and the profound effect these prints had on him as a young boy. On that day, at the Japanese tea garden, he purchased Hokusai's 36 Views of Mt. Fuji. "By the time I was in my early teens," he says, "I was doing these outdoor pictures from all around Marin and Mt. Tam. And I started to get this idea, somewhere between the ages of 12 and 15, that I would do pictures of Mt. Tam like Hokusai's views of Mt. Fuji. So then I carried that idea with me, and I started doing linoleum cut prints and then some wood ones with little Japanese carving tools that I got over in San Francisco." The old carving tools lying in the sunlight on his workbench take on new meaning. Killion continues, "I got to be a pretty good carver by the time I was in my early 20s." So good, in fact, that by the time he had graduated from UC Santa Cruz with a degree in history at age 21 he had printed 28 Views of Mt. Tamalpais. "I meant to get to 36," he says, "because Hokusai did 36 views." He looks out the window of his studio into the yellow west Marin sunlight, and continues, "Mill Valley was a lovely place to grow up. It was a different community then, it was full of bohemians and artists. Gary Snyder lived there, actually. I didn't know that." Snyder occupied a small cabin he called "Marin-an" in Homestead Valley in the '50s and '60s. His love affair with the mountain, like Killion's, is well-documented; Snyder was Jack Kerouac's inspiration for Japhy Ryder, the main Zen lunatic in his 1958 novel Dharma Bums. When asked about his history with Snyder, Killion says, "I'm of that generation of young men for whom Gary Snyder was our hero." His working history with Snyder starts much earlier than Tamalpais Walking. Their collaborative project The High Sierra of California was published in 2005 and depicts Killion's woodprints of the Sierra interspersed with Snyder's poetry inspired by the area. "But I actually started doing things with him many years ago, in the '70s," Killion says. "I got him to donate a poem for a broadside for a land preservation thing in Santa Cruz and then some of my illustrations went into some books that had his poetry in it, and some biographical stuff in the '80s." Killion actually gave Snyder a copy of his 28 Views of Mt. Tamalpais in 1975, right after he finished it. He recalls bringing the book up to Snyder's place, and laughs, saying, "He was more interested in my girlfriend than in me. I was going off on this big trip, and I wanted some advice because he was the great traveler." Killion smiles, "He told me to bring a lot of Kaopectate." Presumably armed with stomach medicine, Killion hitchhiked across the United States and Europe, making his way to Northern Africa, the Sahara and West Africa. Spurred by what he still terms "the epic trip," Killion obtained a Ph.D. in African studies from Stanford. He specialized in Ethiopian studies and went on to work in refugee camps there. He got a Fullbright to spend a year teaching at the University of Asmara. After teaching at Bowdoin College and San Francisco State, Killion says, "I finally managed to quit my day job and just do art, right after that High Sierra book with Gary Snyder. That got me enough notoriety that I could sell enough of my work to make a living." As for the historical element that is unquestionably a part of Tamalpais Walking, Killion says, "I thought I knew everything about Mt. Tam, and I realized how little I knew." Using mostly compiled research and finding some new information along the way, Killion follows the transformation of Mt. Tamalpais from a recreational epicenter in the late 19th century to a silent backdrop when "people forgot about the mountain during the suburbanization after World War II. Gary found it and really loved it when it was least used, in the late '50s early '60s. Then it got rediscovered by the hippie generation as a place to go party." Partly due to Dharma Bums, Snyder became renowned for introducing Buddhism to Western popular culture as an alternative lifestyle. Snyder was among a crowd of "rucksack Buddhists" who started circumambulating Mt. Tam in the '60s. Circumambulation refers to a Buddhist practice otherwise known as "walking mediation." When asked if Killion circumambulates, he says, "I just circumambulated on Sunday for the spring equinox. There is this early Buddhist guy who owned the frame shop in Mill Valley who started doing this solstice-equinox circumambulation with Gary in the '60s, and he's pretty much done it every season and he hasn't missed it ever. He still does, and he's in his mid-70s." Killion's eyes twinkle. "And he's fast," he whispers. When asked if he is a practicing Buddhist, Killion begins a reply, then hesitates, before saying, "I feel like Buddhism is the closest to whatever religious thing I can deal with. I'm not a good Buddhist, but that's the way I feel. I'd like to work on the eight ways to live correctly, especially the one about talking," he laughs. "When I learn how to shut up, I'll start to feel like I can be a good Buddhist."